Stanley Engineered Fastening returns to the Downtown Renaissance District and Inner-City Neighborhoods to undertake additional community volunteer projects. 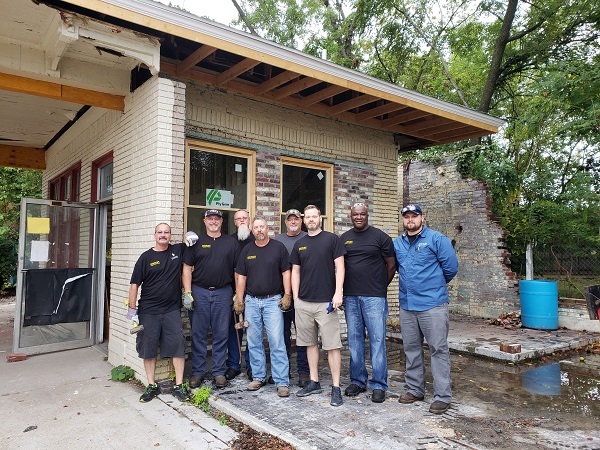 In October of 2017 under the leadership of Adam Perry and Jeff Allen, Stanley Engineered Fastening initiated the Sudden Service Station Restoration Project. Approximately 15 employees of Stanley Engineered Fastening descended upon the southeastern gateway of the Downtown Renaissance District to contribute their time, talent and services toward our ongoing downtown revitalization efforts. This week, they returned to assist with undertaking additional work to ensure the timely completion of this restoration project. The property is being transformed into a public restroom facility to be utilized in conjunction with events at the adjoining Peace and Virginia Parks. 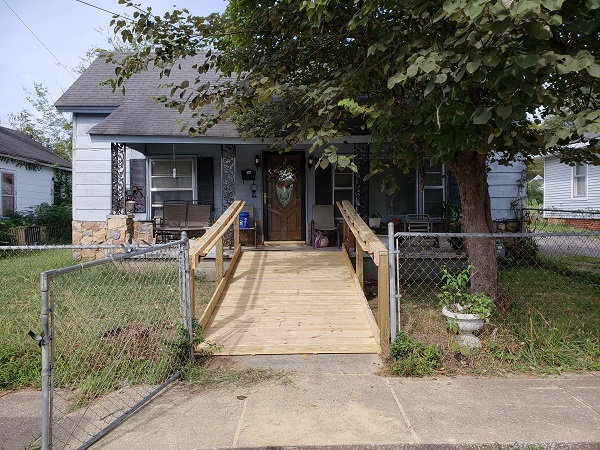 To assist low-to-moderate income homeowners with enhanced accessibility into their homes, volunteers with Stanley Engineered Fastening are also constructing and installing ramps and handrails on homes in the West Side, Canton Pike and Durrett Avenue neighborhoods. Additional work being undertaken includes sealing existing ramps and making porch repairs in order to extend the life of home-owner occupied units. A beautification project being led by Stanley Engineered Fastening includes the placement of trellises in Fred Atkins Park along the northern wall to further enhance the landscaping and aesthetic appearance of the park. Additional public enhancement projects include the construction of planter box covers to be used during the winter months along 6th Street and in Fred Atkins Park. The covers will mimic gift boxes and provide additional decorative flair during the holiday season. The Local Development Corporation oversees the Downtown Renaissance District and Inner-City Residential Enterprise Zone Programs, whose missions are to provide a holistic approach to downtown and inner-city revitalization efforts. Funding for these projects is made possible from the City of Hopkinsville’s annual allocation to the Inner-City Residential Enterprise Zone (ICREZ) Program. The project is being administered by Community and Development Services, with David Carroll and LeeAnn Sorrell spearheading the efforts.